Hello UNiDAYS! 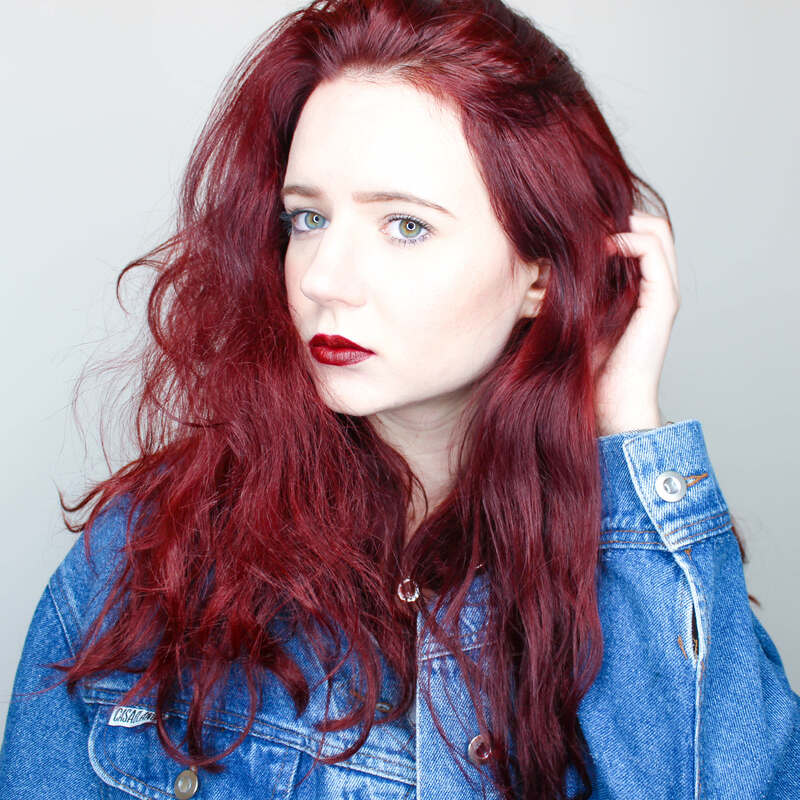 My name's Charley, I'm a nineteen year old student who can usually be found blogging away over at Rambling of a Beauty Blogger but for the month of October I'll be bringing you exclusive DIYs every weekend showing you how to make beautiful things for just a fraction of what they cost in the stores! Today's DIY is all about hair bows. Picture this: It's the Monday Morning after a very eventful weekend, you've woken up late and have to choose between the usual battle of taming your hair or a pit stop at the SU for a nice cup of tea. It's a no brainer! I for one cannot be bothered to fuss with my un-tamable locks, especially first thing in the morning! So my hair is usually down, rocking it's natural waves, which after a while become completely and utterly dull. So why not make something quick and easy that not only looks great but will save you countless time in the morning! Hair bows have been a huge trend throughout the summer and I've amassed quite the collection. The only problem is, when I went to reach for one last week I realised they were all a little on the summer side. So instead of spending hours hunting for just the right one, I decided to try my had at making my very own and was delighted when I found out just how easy it was! 1. For my scrap fabric I used the remainder of a pair of old jeans that I'd already recycled into a pair of bleached distressed denim cut offs during the summer months. At this point, it doesn't matter about being particularly neat or measuring out the material - just make sure it has at least an inch in excess on each side from your ideal bow size. 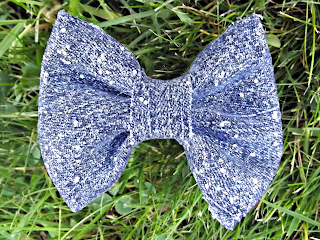 To get a bow that holds its shape well, it's best to use a large piece of fabric and fold it multiple times before you start or use a thicker material such as denim. For a more flexible bow a single piece of fabric will do. 2. Flip the material over to what will become the back of the bow. This is where all the messy gluing will happen that won't be seen from the front. Fold in each of the sides and glue them down, creating four neat sides. Don't worry if it's a bit uneven, you can always chop off or fold in the excess. If your sides can be see from the front of the bow, trim them or fold them inwards before gluing. 3. You should be left with a very neat rectangle of material. Flip the bow over to its front and pinch in the middle - creating creases. 4. Glue the creases to fix them in place and pinch until dry. If you're using fabric glue I'd recommend using a clothes peg, else you could be waiting a while! If your glue spills out over the sides, don't worry - most glue guns and fabric glue will dry clear, and we're about to cover this in the next step anyway. 5. Cut an extra piece of fabric to glue around the centre of the bow to hide the glue. You could either cut another strip of denim (if your using jeans like me) or if you wanted something a little different, you could gut the seam from the leg. If you want to attach your bow to a hair bobble - make sure to add it in before gluing the strip in place, making sure that the join is at the back of your bow. 6. If you want to fix your bow to a hair grip you can do this easily whilst the glue is still warm by slipping it under the fabric strip or you can glue on a hair clip or a hair band. 7. Get creative! This is my favorite bow so far, I used I've even decorated them using fabric paint and a glittery topcoat in the place of glitter spray (Revlon Nail Enamel in the shade Stunning 340) which looks gorgeous when it catches the light! 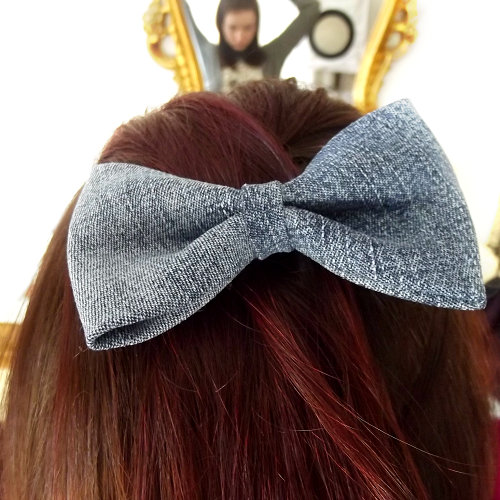 I love to wear mine by tying the top section of my hair into a loose ponytail for support, and then clipping in the bow. 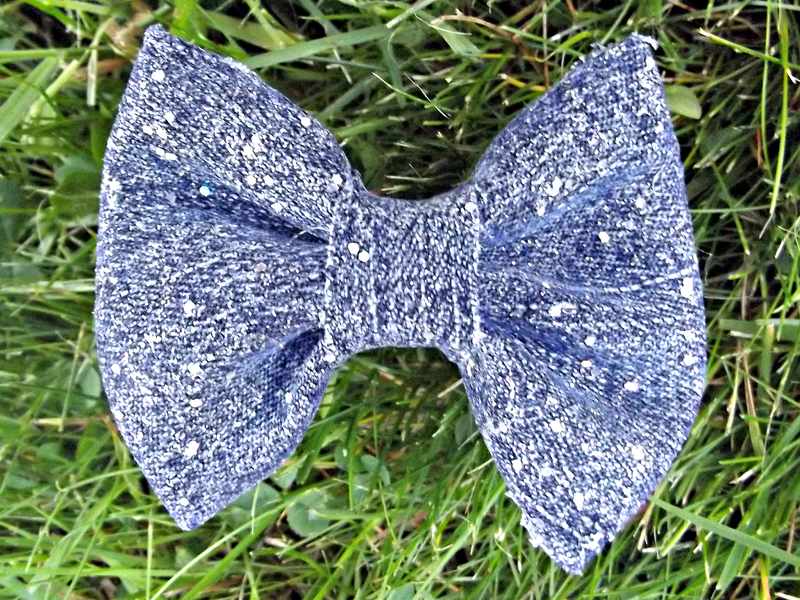 I've made countless of these things out of denim, cotton and lace. You can add these to anything - purses, pencil cases and even use them for jewellery! 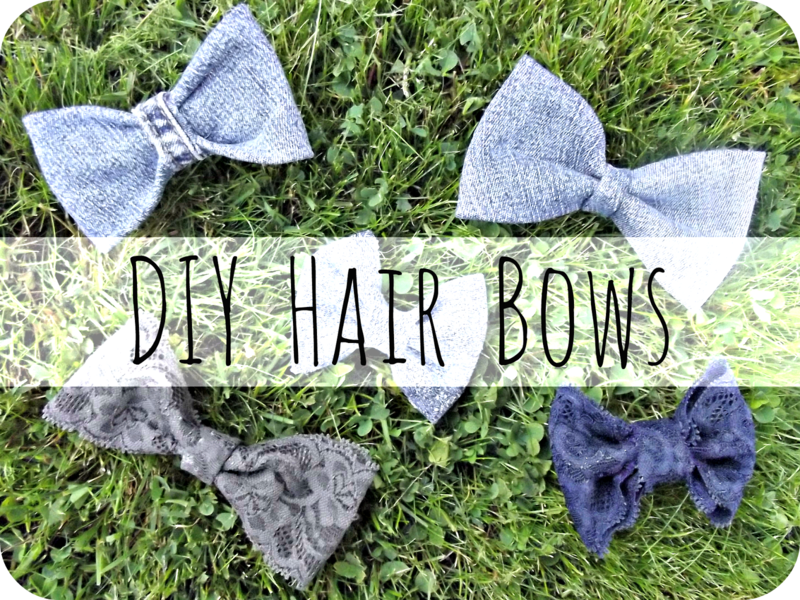 If you make your own DIY Hair Bow, be sure to tweet me a picture @charleylucy! 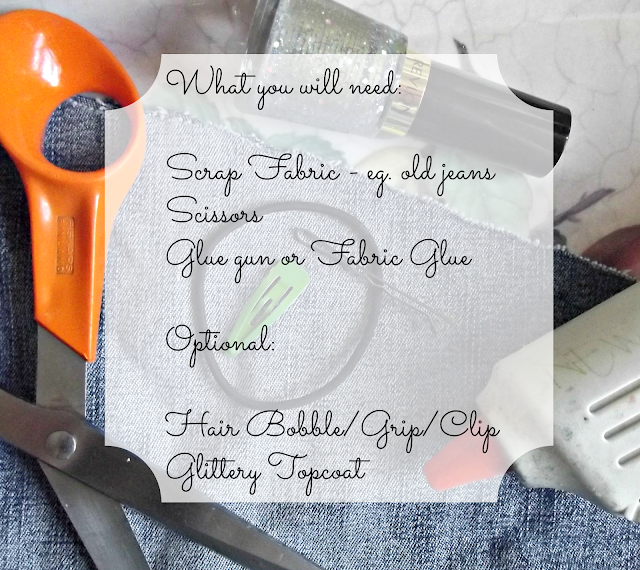 Stay tuned for more DIYs next week!